FRIDAY, January 11, 2019 – Brownlow medallist Tom Mitchell breaks his leg at training. Not only for the prolific ball-winner, but also for Hawthorn's chances of remaining relevant among the upper echelon of the competition – or so the prevailing wisdom suggested. The Hawks went on a six-game winning streak at the end of last season to finish in the top four, but a straight-sets finals exit at the hands of Richmond and Melbourne put serious doubts about their ability to match it with the very best. In his 11th career game, 20-year-old James Worpel had just nine disposals in that second semi-final against the Demons. But in game No. 12, the man dubbed "The Worpedo" attacked Adelaide like a missile through the midfield, helping to fill the void left by Mitchell's absence and life the Hawks to a stunning 32-point win. Worpel was the most dominant player at the Adelaide Oval on Saturday, winning a mountain of contested ball and driving the ball forward at every opportunity. It was his first game in the No. 5 guernsey – a number made famous at the Hawks by Sam Mitchell, Andy Collins and the late Peter Crimmins. Mitchell returned to the Hawks at the end of last season as an assistant coach from West Coast, and is certain to have passed on more than a few tips to his successor. The 45th pick in the 2017 NAB AFL Draft burst on to the scene last year, picking up 32 disposals in his fourth career game in the round 18 victory over Carlton. Going head-to-head with a quality Crows midfield – featuring Rory Sloane, Matt Crouch, Brad Crouch and Bryce Gibbs – was another step up in intensity. Alastair Clarkson told reporters in Melbourne on Friday that the Crows had a superior midfield to what the Hawks were fielding, ensuring his players wore the underdog tag and taking some pressure off them. Worpel wasn't on his own in attempting to pick up the slack left by the absence of Mitchell and his League-leading 35.5 disposals per game from 2018. His litany of knee injuries is in the past. It's easy to see why the Hawks were willing to take a punt on the former Gold Coast star. Liam Shiels was strong in the contest and experienced duo Ricky Henderson and Isaac Smith provided the run on the outside. A perfect example of Hawthorn's dominance came at the first bounce of the last quarter. The ageless Shaun Burgoyne burst away with the clearance and kicked long to Jack Gunston, who used beautiful bodywork on his defender to take the mark. It's impossible to praise the Hawks' midfield without giving their defenders a huge wrap. James Sicily grabbed everything that came his way in a performance to suggest he'll be in the discussion for All Australian honours this year. Newly installed captain Ben Stratton and James Frawley gave Crows forwards Eddie Betts and Josh Jenkins no room to move. The Hawks were brilliant from start to finish. The bad news for their rivals? 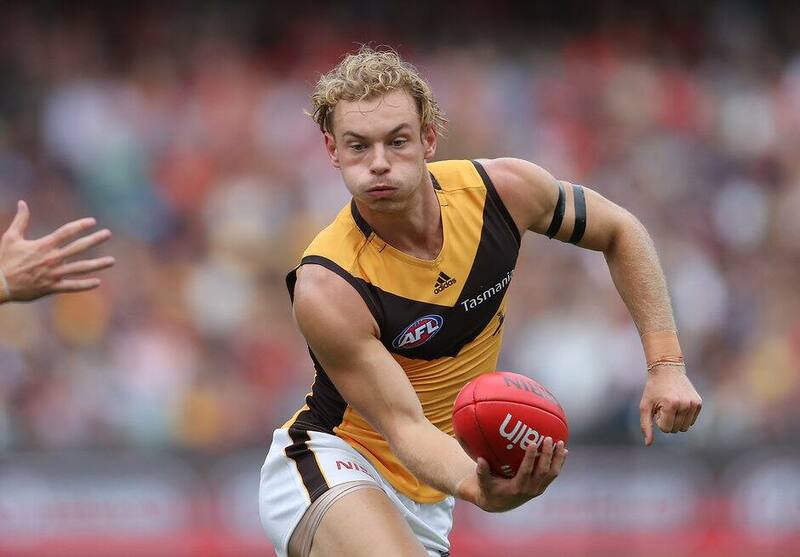 Clarko's men are likely to only get better. Prized recruit Chad Wingard isn't far away from debuting from his new club as he gets over a calf injury, while ex-Greater Western Sydney midfielder Tom Scully could also be unleashed in the next month after making positive progress from a broken ankle. Even without Mitchell, write the Hawks off at your peril in 2019. Two months is a very long time in footy.